These wonderful striped hammock chairs capture the essence of a nautical and marine theme, and are perfect for lounging near the beach. Each style features blue and white stripes with separate designs printed on the back cushions. 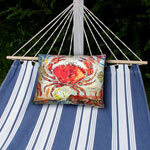 Choose a large orange crab as a specialized design, or select a print of a rooster or flowers as a theme. No matter which design is chosen, the quality and durability of these hammock swinging chairs is unprecedented. Select the chair below with a Decorative Back Pillow that matches your personal style! View our most popular combinations below. The bottom & back pillows ARE NOT sewn in, so you can purchase extra 19" x 24" pillows to swap into the chair and give it an entirely new look as often as you like. If you prefer a back pillow not displayed below, simply give us a call and tell us the fabric and pillow combination you desire! Each style is fashioned with weather and mildew resistant polyester that is machine washable and doesn't fade. 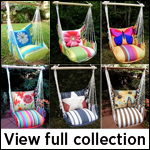 These swings are perfect for hanging from a tree branch, porch, patio, deck or house boat. During choppy weather on the water, rest assured that this chair will gently sway in the breeze, thanks to a 33-inch wooden spreader bar constructed from strong Chilean pine that keeps it perfectly balanced. Each chair can support up to 250 pounds.